With the “Sticker Day”, the press conference that took place this morning at 11:30 am in Venice at Palazzo Balbi, headquarters of the Veneto Region council, the President of the Veneto Region Luca Zaia and the President of the Consortium Promovetro Luciano Gambaro together with representatives of Confindustria Venezia and Confartigianato Venezia, symbolically started the phase diffusion of the Vetro Artistico® Murano traceable trademark to protect the customer about the originality of the Murano glass objects. 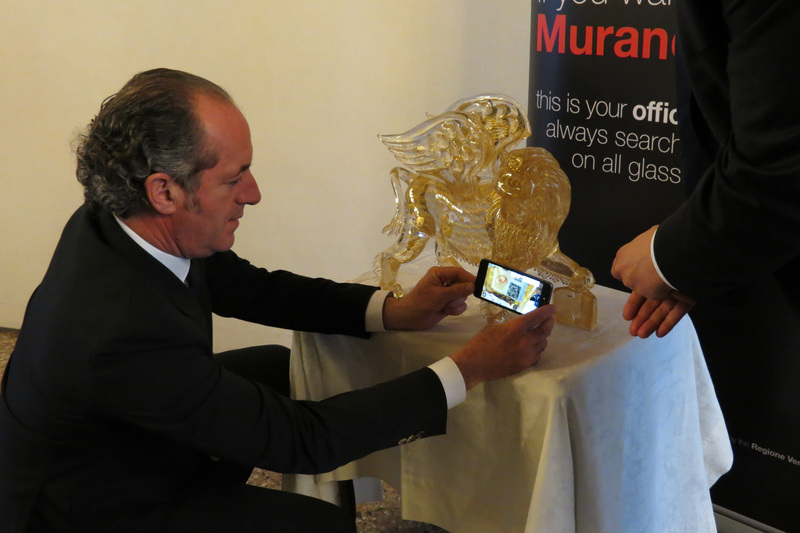 President Luca Zaia, has in fact first symbolically placed the “first” stamp of a Murano glass sculpture (a winged lion) and then with a smartphone, through the reading of the data matrix on the label, read the description of the artwork, observes the photos reproducing the lion and admiring the video of its realization. The new label, presented some months ago, is realized with the support of the Veneto Region and the Chamber of Commerce of Venice following the most modern technologies and will enable the final user to retrace, via smartphones, tablets and PCs , the entire product history, reconstructing its creative process.